Recycling is collected every week. There is no limit to how much recycling you can set out for collection. Check your collection calendar or the tabs below for information about what can be recycled at the curb. Please use approved recycling containers. The maximum Blue Box size is 61L. Need replacement blue boxes, grey boxes or bags? Use your Grey Box for glass, collected separately from other containers as of July 2015.
remove food residue. Lids and caps must be removed and recycled in Blue Box. Newspaper and mixed paper are combined for collection in the Yellow Bag, as of July 2015.
cut cardboard down to fit the Yellow Bag, or neatly tie into bundles measuring no larger than 60 x 60 x 15 cm. Please use biodegradable string or twine. No wire or plastic strapping. Blue Bags, formerly used for newspaper only, are now being phased out. Want to recycle even more? That’s great! The Recycling Council of British Columbia’s online Recyclepedia provides a list of many different items, where to recycle them and what to do with the ones you can't recycle. Or call the recycling hotline at 604-RECYCLE (604-732-9253) to speak to someone. Why is glass collected separately? Glass containers can break easily during collection. When broken glass mixes with other containers it makes materials more difficult to recycle. 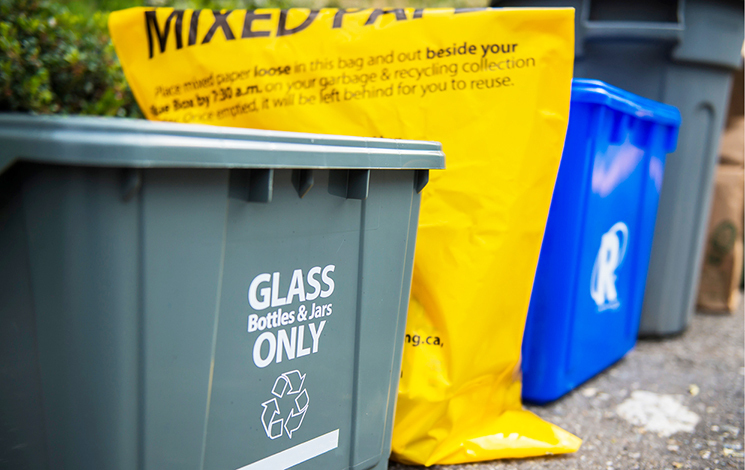 A new province-wide recycling regulation came into effect May 19, 2014, which requires glass to be collected separately from other materials. Separated glass collection means glass can be recycled from the curbside or recycling room, instead of being taken to a recycling depot. With the help of the North Shore Recycling Program, we consulted residents to find out what is important to them when it comes to who makes recycling service decisions, the type of recycling service they prefer to receive, and their willingness to pay for various levels of service.